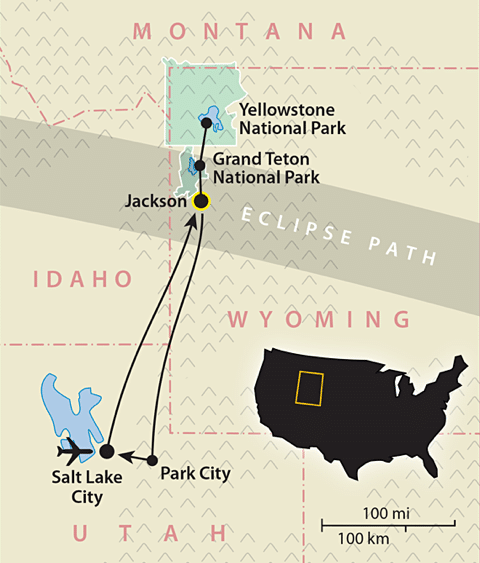 Two of America’s most celebrated national parks, Yellowstone and Grand Teton, provide a stunning backdrop for the first total solar eclipse viewable from the continental U.S. in nearly four decades. If you’re not able to join us for our longer National Parks of the American West trip in the summer of 2017, this compact six-night adventure is an ideal way to experience the magnificent beauty of our own backyard en route to viewing the August 21 eclipse from our specially selected vantage point near Jackson Hole, Wyoming. Beginning in Salt Lake City, Utah, we journey northward to spend three nights in Jackson Hole, your home base for exploring the Tetons and Yellowstone – the first national park in the U.S. and still a captivating showcase of geysers, canyons, and wildlife in a protected wilderness ringed by mountain peaks.